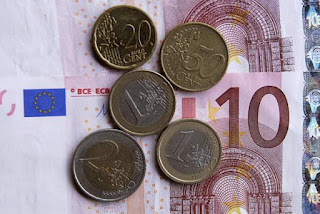 The euro was on track for its biggest single day fall since last October after the European Central Bank said it would keep interest rates steady at least until summer 2019. The currency dropped sharply within minutes of the announcement, initially falling from $1.1820 to $1.1725, to trade at 1.1638 by 4.30pm. ECB president Mario Draghi said: "This decision has been taken in the presence of a strong economy with increasing uncertainty," related to rising trade tensions between the US, Europe and China. Mr Draghi made the announcement at a news conference following the bank's meeting to discuss eurozone monetary policy. The euro had initially risen during the meeting, after the ECB said it would phase out its financial crisis-era stimulus programme for the 19-country region by the year-end. The bank said that the stimulus programme's bond purchases would be halved to €15bn per month from October. The purchases would then be wound up completely after December.